Our 2016 Monaco F1™ Grand Prix hospitality packages include some of the sought-after VIP hospitality suites, terraces and rooftop viewing facilities available around the Monaco Circuit, located in Monte Carlo. The prices of all our Monaco Formula 1™ VIP hospitality packages include privileged viewing of the race activities from VIP suites, rooftop terraces and apartments, fully inclusive of gourmet food and full bar services. All our Monaco F1™ Grand Prix hospitality packages, VIP suites, apartments or rooftop terraces are available to both individuals as well as VIP corporate groups. We can also tailor make our F1™ hospitality packages to completely meet your needs, including company branding – please contact us for more details. Should you decided to book any of the Formula One™ Grand Prix VIP hospitality packages or suite options – no further Grand Prix race tickets, as listed on our Monaco F1™ tour packages page, will be required. All the facilities in Monaco are totally overextended during the F1™ Monaco Grand Prix, including the VIP suite and terrace viewing facilities. Getting professional advice can make all the difference – F1 Grand Prix Tours have been doing this for 10 years! 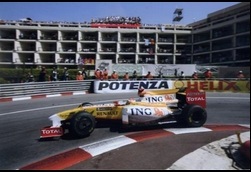 Experience the Monaco Grand Prix from the comfort of your reserved grandstand seat on a specially constructed hotel roof top grandstand. The atmosphere is simply fantastic, as you enjoy the racing and the ambience from this roof-top swimming pool venue, offering stunning views over the sea as well as unobstructed views of the technical difficult Fairmont Hairpin, known for its high race action. A light, simple and casual style lunch buffet is served, which superbly matches the poolside atmosphere, as well as a selection of drinks including selected wines, beers and soft drinks (11h00 – 16h00). Enjoy the best and unobstructed views of the famous and action packed Fairmont Hairpin from our luxurious FM VIP Suites. Each suite has a sheltered private balcony, which is limited to just 14 guests each. Plasma TV screens located inside and outside the suites, will help you to keep abreast of the action as it unfolds around the circuit. A fine buffet lunch is served from within our suite, as well as Champagne, selected spirits, fine wines, beers and soft drinks, which are served from the open bar for the duration of days’ the racing activities. TV screens located inside and outside the suite. Located in the Hotel Hermitage, our HH VIP Terrace offers you stunning trackside views of the cars as they exit the first corner at Sainte Devote and race up the Beau Rivage Straight before they enter the Massenet Corner – spectacular race viewing over one of the fastest sections of the Monaco circuit. A giant television screen located directly opposite the terrace, will keep you updated on the race around the rest of the circuit. A superb buffet luncheon is served in the hotel’s restaurant as well as an afternoon drinks package inclusive of Champagne, fine wines, beers and soft drinks, which is served from this superb terrace featuring the Monaco Harbour as a magnificent backdrop. Probably the most sought-after rooftop terraces for the 2016 Formula 1™ Monaco Grand Rix. For 2014 it was snapped up by various VIP sponsors and guests due to the spectacular panoramic views over three quarters of the circuit and across the Monaco Bay. Carefully selected to provide guests with the perfect balance of comfort, breath-taking race views and 5 star hospitality for the worlds most prestigious F1 race. There is no other terrace available at the 2016 F1™ Monaco Grand Prix, which allows spectators to see so much of the track while being so close to the action. You will be able to look down on the Start/Finish Line, Tunnel Exit, Chicane, Sainte Devot, Tabac and Piscine Corners, The Pits and Pit Exit, and the Main Straight! For an alternative VIP Monaco Prix Grand experience, follow the Saturday’s qualifying proceedings from either our FM VIP Suite or our HH VIP Terrace and watch the race unfold on Sunday from our recommended Grandstand L.
Grandstand L is located at the fast and blind entry, Turn 15 Chicane with absolutely no run-off areas. The stand also offers great views of the exciting pit lane action as well as a dedicated bigscreen TV located directly opposite the stand, from which you can follow the race action on the rest of the circuit. Your VIP day in the suite or terrace, will be fully inclusive of the hospitality services as described above.